Do you ever have some Fridays where you feel more emotionally/physically/mentally worn out than others? I do, and today is one of them. I am attributing it to the headache slash low-grade migraine that I have been battling all week long (I have issues with atmosphere changes, so these evening summer storms this week have been killing me) but no matter the reason, I am especially glad today is Friday and that the weekend is soon upon us! Word on the street is that in two weeks, some of our local brewpubs are planning to help us out on very such a Friday, where we all need to kickoff the weekend extra well. Enter the Freaky Friday Atlanta Brewpub Crawl, running from 6-11 PM on Friday, Aug. 13. 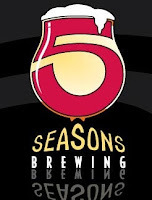 The FF Crawl is featuring three area brewpubs -- Five Seasons Westside (love! ), Max Lager's in Downtown, and Twain's in Decatur. Each one will be offering a special cask ale for only, get this, $3 per glass. Hop on and off a bus circuit to go from each place at your own leisure. Tickets for the bus circle are $5 in advance, $9 day of. All in all, you are getting quite the tour of town, and as long as you set up some transportation to/from the event, you are set to drink your cask off!